Proprietary Name: Hims Minoxidil What is the Proprietary Name? 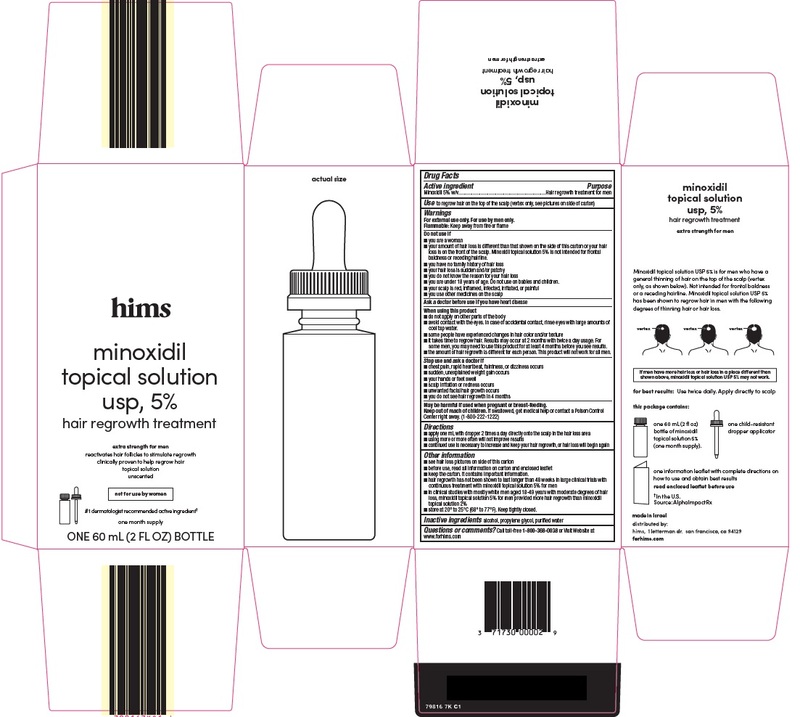 Hims Minoxidil with NDC 71730-798 is a a human over the counter drug product labeled by Hims, Inc.. The generic name of Hims Minoxidil is minoxidil. The product's dosage form is solution and is administered via topical form. FDA Application Number: ANDA075598 What is the FDA Application Number? •do not apply on other parts of the body •avoid contact with the eyes. In case of accidental contact, rinse eyes with large amounts of cool tap water. •some people have experienced changes in hair color and/or texture •it takes time to regrow hair. Results may occur at 2 months with twice a day usage. For some men, you may need to use this product for at least 4 months before you see results. •the amount of hair regrowth is different for each person. This product will not work for all men. •see hair loss pictures on side of this carton •before use, read all information on carton and enclosed leaflet •keep the carton. It contains important information. •hair regrowth has not been shown to last longer than 48 weeks in large clinical trials with continuous treatment with minoxidil topical solution 5% for men •in clinical studies with mostly white men aged 18-49 years with moderate degrees of hair loss, minoxidil topical solution 5% for men provided more hair regrowth than minoxidil topical solution 2% •store at 20° to 25°C (68° to 77°F). Keep tightly closed.